It’s time for the statistics derived from the Cyber Attacks Timelines of November (Part I and Part II). 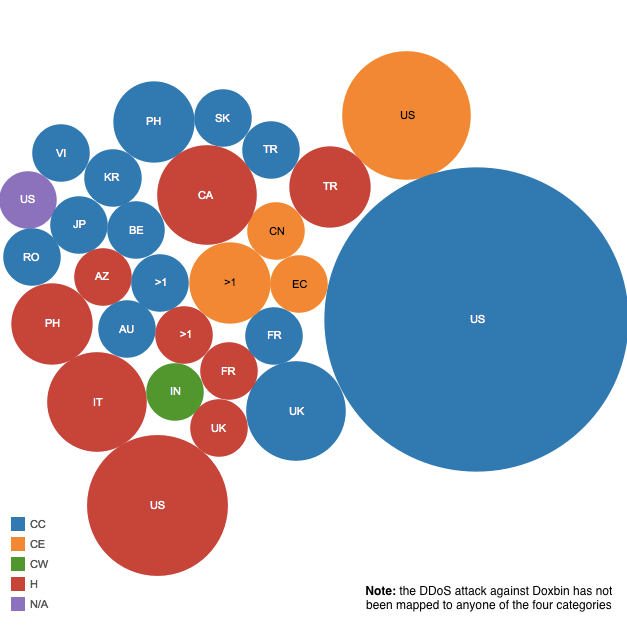 Let us begin with the Country Distribution chart that, easy predictable, shows the US on top of all categories. However, globally, even Italy, Canada and UK show up, respectively for Hacktivism (the first two countries) and Cyber Crime (the latter). The Daily Trend of Attacks chart shows a moderate activity with a peak on the 10th, and a plateau between the 13th and 14th. Despite the 5th of November is a day felt by Hacktivists, no noticeable operations have been recorded this year. Once again Cyber Crime leads the Motivations Behind Attacks chart with 55.8% substantially in line with the previous month (was around 60%). Hacktivism ranks at number two with 28.6%, a remarkable increase compared to 13.8% of October. Whereas Cyber Espionage remains quite high (13%, despite in decrease compared to the record value of 17.2% recorded in October. 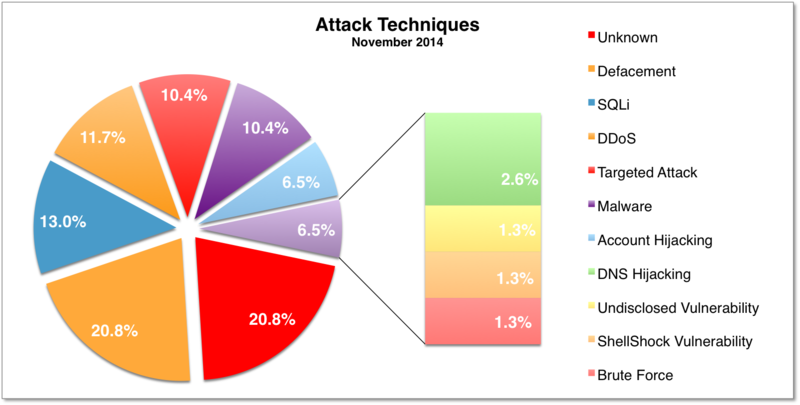 Defacements lead the Attack Techniques chart with 20.8% (among the known attacks). SQLi ranks at number two with 13.0% very close to DDoS, at number three with 11.7% (a consequence of the hacktivism driven hacking spree recorded in November). Targeted attacks rank at number four with 10.4%, still quite an important value, even if in decrease compared to 13.8% of October. For the third month in a row, industry ranks on top of the Distribution of Targets chart (28.6%, nearly identical to October when it was 28.7%). As always governmental targets rank at number two (23.4%). While organizations are back at number three (14.3%). Again, targets belonging to E-Commerce rank on top of the Industry Dill Drown chart, while political organizations lead the Organization Drill Down chart. As usual, the sample must be taken very carefully since it refers only to discovered attacks included in my timelines. The sample does not pretend to be exhaustive but only aims to provide an high level overview of the “cyber landscape”, or at least of the ones that gained space in the media (yes, using an abused expression this is just the tip of the Iceberg). If you want to have an idea of how fragile our data are inside the cyberspace, have a look at the timelines of the main Cyber Attacks in 2011, 2012, 2013 and now 2014 (regularly updated). You may also want to have a look at the Cyber Attack Statistics.